Next up in my Irish War-band for Saga are my warriors . The Irish Bonnachts. Made up of 3 groups of 8. Totalling 3 points in Saga. Most are armed with javelins. Though for variety I have included some command and feature characters which offer some aesthetic variety. 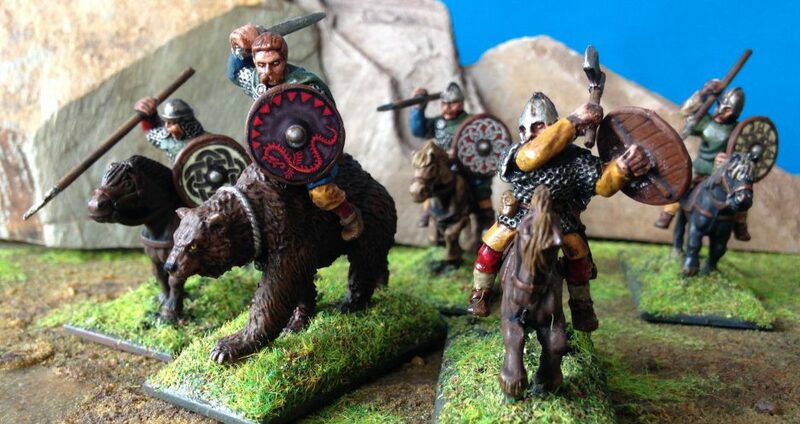 They are mostly made up from Footsore’s excellent range of Dark Age Irish models, here and here with some additions from Warlord’s Celtic range. The banner is from the extensive range offered over at Little Big Man. I’m again pleased with how these have turned out each group has a lot of individuality colour and character. I think I have managed to inject just enough colour without overdoing it for the dark ages. All of which my earlier Welsh Priodaur (Warriors) were definitely lacking. I’ve been continuing to really enjoy the photographing and compositing process. I have learnt a lot and am happy with my progression and continue to move forward with the practice finding my way though trial and error. I have found the Irish to be a formidable force on the gaming table a good match for all comers and great fun to play. Hope you enjoy I certainly have. So I’m back at the table and keen to show off my Irish War-band That I was working on when last I was blogging. First up are my Levy. The Irish Kerns. Made up here of a group of 12 slingers, 1 Point in Saga. I made the group up from a mix of figures from Crusader slingers & skirmishers and slingers from Warlord. I’m really pleased with how they’ve turned out, with a lot of character. You can see everyone in the settlement banded together to drive back the invaders. With the Irish’s formidable shooting abilities they make a force to be reckoned with on the table. Strategically placed they can be a real headache for your opponent for a good many turns and a considerable drain on their troops. Lots of fun to play ! I was on the road in the south west a fair bit lately so decided to stop and make an inspirational visit to Stonehenge. This was my favourite of the photos I managed with my phones camera. At one point as we made our way round a Merlin settled atop what is left of the Great Trilithon and peered down at us before flying off to the South East. A nice romantic poetic moment for me. I will be thinking of this visit when I am painting my ring of miniature standing stones.